I attended the first Wine Maker’s Dinner at Rafati’s Encore310 on Thursday, along with my friends Steve and Krista. They plan to make these monthly events, featuring local winemakers. Maysara Winery was featured, and I am a member of their wine club and enjoy their wines. I was looking forward to the food just as much. Encore310 is owned by Reza and Georgia Rafati and they specialize in Northwest cuisine produced with local products. We were greeted by Reza and the members of Maysara’s Momtazi family. The 2007 vintage is Tahmiene Momtazi’s first year as the winemaker. It was also a very rainy year, resulting in very low brix scores for the grapes. This made its mark on the wines produced in 2007. My husband and I found ourselves stocking up on the 2006 vintages as we prefer the fuller fruit flavor of that year. Tahmiene said that she had been studying with DePonte’s winemaker, Isabelle Dutartre, and that bodes well for us, as DePonte is our local favorite. We first had champagne and smoked salmon/goat cheese appetizers. I could have eaten a plate of those alone. But at 7 pm we were ushered into the dinner room and encountered a grand place setting with wine glasses and utensils for each of the next six courses. With each course, Tahmiene or her father Moe Momtazi described the wine, the wine making process, and their vineyard philosophy. They practice biodynamic farming and are striving to make biodynamic wines. This method uses as few “inputs” as possible, relying on having a balanced ecosystem in the vineyard to produce healthy crops. The first course was dungeness crab cakes with a 2007 Maysara pinot gris. Loved both. Each table sat 6 people. On my left was Carol Thomas, whose husband operates Wine Tours Northwest. The other couple at the table were wine stewards from a restaurant and the Gresham Fred Meyer. Carol asked if we were “winos.” I said I was, but Steve and Krista were more newbies and here to learn. I learned quite a few tidbits about the wineries and the wine scene in Portland from my table companions. I also thoroughly enjoyed meeting Carol and I hope to see her at future events. The second course was a roasted beet and baby greens salad, with 2007 Maysara Roseena Rose. I am not usually a rose fan, but I like the Roseena. The salad was perfect. The third course was steak tartare and foie gras mousse with the 2006 Maysara Jamsheed pinot noir. This is one of our favorites from Maysara. Krista and Steve discussed how it tasted different between the steak tartare and the foie gras. I realized my palate wasn’t educated enough to feel the difference in wine and food pairings. I loved the food and the wine. The fourth course was a cassoulet with artisan sausage and the 2007 Maysara Estate Cuvee pinot noir, one of Tahmiene’s wines. This was Krista’s favorite wine of the night. It definitely is the lighter kind of pinot that was produced by the 2007 grapes. 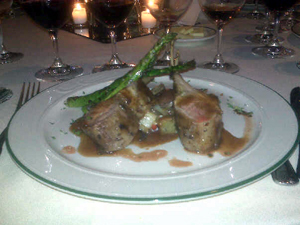 The fifth course was rack of lamb with potatoes and 2007 Maysara Asha pinot noir, one of their top-priced wines. We were really getting stuffed by this point, although the portions on the plates were appropriately small. I like the Asha, although it could use more cellaring, and it is not as fruit forward as the Jamsheed. The sixth course was really two courses. First we got a cheese and nut plate with the 2005 Maysara Delara pinot noir, also one of their top-priced wines. It was delicious. Then dessert arrived, a brioche with quince and the 2005 Maysara Anahita riesling. We had been discussing rieslings and this one was not a typical riesling. Unlike all of the other food, I thought the dessert was just too sweet and not very interesting. But the rest of the evening was so far above hope and expectation, and we were so stuffed, that I can’t complain. I shall keep tabs on the Encore310 wine dinners and plan to attend. The price is a great value – $75 includes tip. Krista is the Your Money Examiner at Examiner.com and she endorses saving frugally for splurges such as these. Encore310 has received the Wine Spectator Award of Excellence. I believe that next time I may even book a room at the attached hotel so I don’t have to throttle back on how much wine I drink of each glass. The dinner lasted from 6:30 pm till 9:30 pm. It was a full evening’s entertainment and left us satiated and eager to return. 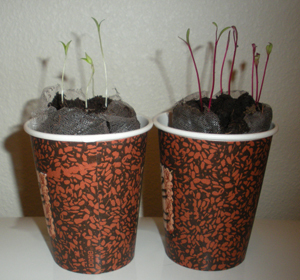 Two days after planting my seeds, I have beet sprouts and collard sprouts! I really love the Jiffy Greenhouses. They are reusable and have almost no mess. I did all of the planting in my kitchen and they are incubating in my bathroom. Once I’ve sprouted and transplanted my seedlings, I can buy more seed starting disks at any local garden center and start the next round. This will be especially useful for crops like lettuce where you need to replant every few weeks. My freezer is almost devoid of last autumn’s bounty. Tonight I use my last batch of slow roasted tomatoes for a puree to top baked parmesan chicken breasts. I’ll have only a bag of whole frozen tomatoes I plan to use in soup and chili, a few cubes of pesto and some forgotten frozen garlic tips I should use in soup. The Vancouver Farmers Market starts up again this weekend – and none too soon! Pollan has a simple 7 word mantra for how to eat: Eat food. Not too much. Mostly plants. I think I shall take to chanting that as a pre-meal prayer. Or, a pre-shopping prayer as the biggest hazards to your health and waistline are found on the supermarket shelves marketing pre-processed foods — many with nutritionism-based claims. Most enlightening was the chapter on the sad state of nutrition research. We see this all the time as yesterday’s nutrition villains, such as eggs, are today’s heroes. Yesterday’s answer to high cholesterol – margarine vs. butter – is today’s villain – trans-fat! Do we really now know the whole truth, or is this just more over-hyped research? What should we eat? Pollan says – eat food. Get basic and eat only foods your grandmother or great-grandmother would recognize as food. Cook and eat meals rather than snacking. Don’t drink sodas filled with high fructose corn syrup. Don’t eat too much food. Ay, carumba, there’s the problem. My husband claims he’s gotten fatter since I joined a CSA and began cooking real meals with real food. The problem – too much food! Too tasty! But this is something we can address with portion control rather than going back to packaged foods. Mostly plants: our Western diets are too full of meat. In our quest to eliminate carbs, we have replaced plants with meat, and even with plant-based foods we have replaced leaves with seeds. We eat too much processed flour and polished rice, not enough leafy vegetables and whole grains. The solution? Pollan touts CSA farms, for the same reason I found. I eat a much wider variety of veggies because my farmer puts them in my share and I have to use them. Just going to a farmers market, I came back with the same thing every time until the CSA introduced me to a wider variety of veggies. I listened to the Audiobook Version , read by my favorite reader, Scott Brick. But in truth, I would prefer a different reader. Scott Brick ended up sounding strident and every statement sounded ironic or sneering. Love you Scott, but it got overwhelming. I would prefer a gentler reading of this book. It’s time to plan the garden. In my case, it’s time to create the garden out of the area I left barren in the back yard when we moved into the new house a year ago. 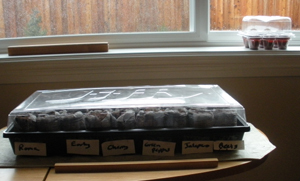 Our soil is mostly rocks, so it isn’t possible to just till it up and add compost and seeds. I also want to plan for the least maintenance, so I need to adjust the automatic sprinkler system to water the garden. I contacted the landscaper our development is now using and spent a pleasant 30 minutes discussing my dream garden with Tim of Water-Rite, Inc. He immediately steered me away from raised beds. He pointed out that the area I wanted to use was already well-contained, all it needed was a bed of good garden soil. I didn’t need new sprinklers, just changes to the existing zone of sprinklers. I liked the idea of not building raised beds that will eventually decay and look shoddy. Also, with the new plan I could change the area to anything wish in the future without having to dispose of the raised beds lumber and hardware. I’ll also have the sprinklers extended to water my hanging baskets from above. I’ll have to come up with some other weight lifting regimen vs. daily plant watering. And I’ll be able to take a long weekend without coming home to dessicated hanging baskets. The cat can care for herself for days, but plants need lots of attention! The price tag isn’t cheap (about $500), but this is an investment that will pay dividends for years to come. I spent about $200 last year on self-watering containers, potting soil, and plant starts. My new garden will have far more growing potential. Now I’ll have to go browse the seed aisle!